This challenge was started two years by Julie Cornewell at her blog. I then asked to take over as host of this challenge for 2018, and will bring it back once again for 2019. You are by no means limited to what is suggested in the links above. Any books you find that fit the challenge description may be read toward the challenge. Anything which gets people reading is a good thing. I plan on focusing next year on books about spinning fiber into yarn and colored pencil drawing. Laura Morelli's Venetian Artisan series entry for 2019 will be another book that I will be reading. This is a great challenge. I have been in a rut and I need to stretch my creativity so it's a challenge just to figure out what creative area I want to do. My blog url changed yet again do to a credit card glitch but thanks so much for still giving me credit for creating the challenge! I was planning to read more writing craft books this year. So glad you made this challenge! So happy that I found this challenge, as I've been trying to read more crafting books lately! I would like to play with/review some writing books and this gives me an inventive to do that. Thank you! 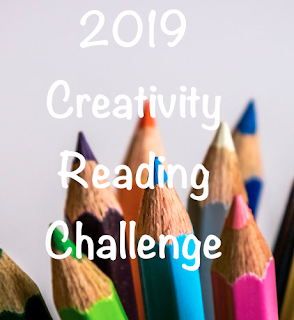 Here goes for the Creativity Reading Challenge. What happens when google/blogger shuts down in March 2019 ? You mean Google Plus? Blogger will still be around.